Let us help you with your Computer, Cell Phone - Tablet Repairs, and Managed IT Services needs. Contact Us - Sweet Memory IT Services & Support, Computer Repair, Cell Phone - Tablet Repair and Accessories. 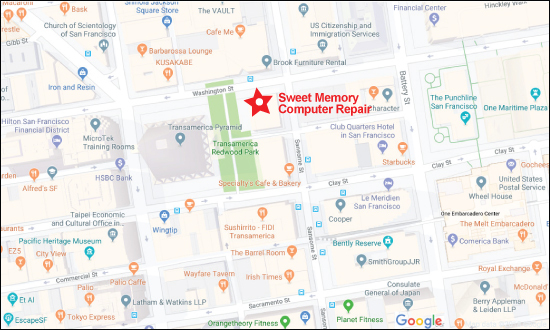 Sweet Memory offers extensive Repair, Data Recovery and Support Services for Computers - Laptops, Desktops, and Servers. We provide a full range of Mobile Device Repairs for iPhone, iPad, and Samsung Galaxy. Our Store located conveniently in San Francisco's Downtown Financial Disrtict, near SOMA, and Stocks a wide array of Computer parts, Memory & Hard Drives, Cables, Computer, Cell Phone - Tablet Repairs & Accessories. Our Team of IT Professionals provides unparalleled, end-to-end support ensuring that Critical IT Infrastructure is kept up and running. We offer cost efficiency with a Monthly Flat Fee, Bundled Services, or Bulk Hour Packages. Highly Rated - Sweet Memory Computer Repair & Business IT Support.